GROSSMONT COLLEGE — The Hyde Art Gallery was busy and full of Grossmont students, teachers, parents, and art enthusiast all enjoying the 300 + pieces on display. The night also included complementary pizza and cookies with coffee and soda to drink. The occasion: The awards ceremony May 17 honoring winners of the Student Art Exhibition. Twenty-nine awards were given in seven different categories such as best of show, award of merit, art and design club, digital, art history, ceramics and photography. The honor of best of show and winner of $200 was awarded to Marie Ritz for her photo piece,” Grandma’s Pin”. Ben Aubert, the gallery’s curator, said he was mesmerized by its unique scale and felt the win was well deserved. I was drawn to a piece by Victor Zepeda. His self-portrait, appropriately titled “Me,” won the Art and Design Club award. Although the piece is a self-portrait, Zepeda said his brother was the primary inspiration. The piece was selling for $75 of which Victor stated “ Its kind of high because I want to keep it.” Then his brother Tony Zepeda interjected, “I’ll buy it from you.”Victor also said the drawing is not meant to be serious; it’s meant to be funny. LA MESA, California –With school funding declining, many programs, including Office Professional Training (OPT) at Grossmont, hold fundraisers at local restaurants to assist in their needs. At Souplantation in La Mesa on Thursday, O.P.T. added funds to its program coffers.The deal was that the restaurant donated to the OPT 15% of customer-designated sales including dinner and a drink. To incentivize supporters to participate in the Souplantation fundraiser, OPT gave away gift baskets. In its continuing campaign, OPT held a fundraising walk On April 30. Now it is calling on supporters to go to Goodsearch.com and search for Grossmont College. Whenever people search, a penny in donated to O.P.T. The OPT program is a one-semester course for office professionals that specialize in accounting, insurance, banking financial services and office administrative support. The training program last 17 weeks and students are enrolled in 12-20 units of college credit. All students take courses in keyboarding, office procedures, effective job search, business English communication, Microsoft word and Microsoft excel. GROSSMONT COLLEGE — Rio is the latest animated feature from Blue Sky Studios, the creators of Ice Age. Although this movie is rated G, it is not just for kids – it’s a good date movie as well. The story is about Blue (Jesse Eisenberg) a tropical bird from Rio de Janeiro, but misplaced in Minnesota, who returns to his home to ensure the survival of his species. Blue grows up ‘protected’ and never learns to fly. An exotic bird scientist (Rodrigo Santoro) finds Blue and convinces his owner to bring him to Rio de Janeiro so Blue can be mated. The mating doesn’t go exactly as planned as Blue and his match Jewel (Anne Hathaway) are captured. They escape with the assistance of a series of characters including a Toucan played by George Lopez. Lopez’s voice is awkward for the toucan – it just doesn’t sound good. Other than that, the movie was funny. A highlight for me was the pick-pocketing gangster marmosets that distract tourists with tricks to steal watches. At one point in the movie, a standoff ensues between birds and monkeys, then someone yells “Birds versus monkeys!” and they all fight. In a real fight the monkeys would win but, because Rio is a bird movie, the birds win. GROSSMONT COLLEGE—The Hyde Art Gallery on campus will host the annual student art exhibition May 9-19. Mixed media pieces representing almost every art form are expected to be on display including ceramics, digital media, photographs, paintings, drawings, jewlery, sculpture, 2-D and 3-Dimensional design. An awards ceremony and reception is planned from 7 to 9 p.m., May 17. 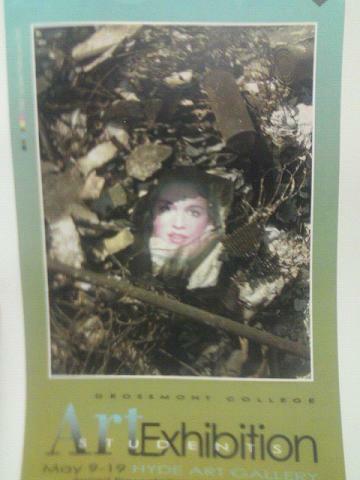 Exhibitors will be students currently taking second-semester art classes at Grossmont. Recommendation of a faculty member is a prerequisite for entry, with a limit of two pieces per student. Approximately 300 works are expected to be shown at the free exhibit. Ben Aubert, curator of the gallery, said the goal of the exhibit is “to display work that represents the best work of the students over the last two semesters.” Judging will be by an art council that will award cash prizes for best-in-show and in each individual art form. Exhibitors who wish to sell their works may do so. Editor’s note: Voting for ASGC officials starts today. This past week our reporter spoke to some candidates and filed this story. GROSSMONT COLLEGE—It’s April and besides your taxes, this month the Associated Students of Grossmont College (ASGC) will be holding elections. Most of the candidates will be running unopposed but see this year’s elections as a way of getting students more involved and aware of ASGC and the many benefits it has to offer students. In case you were unaware ASGC helps organize and regulate campus activities. It also donates half of its expenditures to academic and other school department in the form of grants, helping them buy things like sports equipment, cadavers, Bunsen burners and computers. The election will take place April 11th and 12th. The ballots will be an all online process. Students will be notified by email, not necessarily at their school email account, but at the email address that was set up with their web-advisor account. Last year’s election had a less-than-1% turnout. I had a chance to speak with a few of the candidates about their take on this year’s election. GROSSMONT COLLEGE –Art students will have a chance to show off their work and compete for prizes and scholarships at the upcoming Student Art Exhibition, which runs from May 9 to May 19 at the Hyde Art Gallery. To be part of the exhibit, students must be taking an art class and submit a piece that relates to their class at Grossmont. Awards will be presented at a special gallery opening on May 17 at 7 pm. Commentary: what’s to know about petitions? GROSSMONT COLLEGE — When they solicit Grossmont students’ signatures for the three forms on their table, Tony Willison and Randy Shimizu get, according to them, no hourly wage or compensation for signatures for a petition to overturn Prop 8, receive nothing when someone fills-out a Voter Registration, and are paid only one dollar for every signature on a petition whose aim is to create a new political party – The Americans Elect.